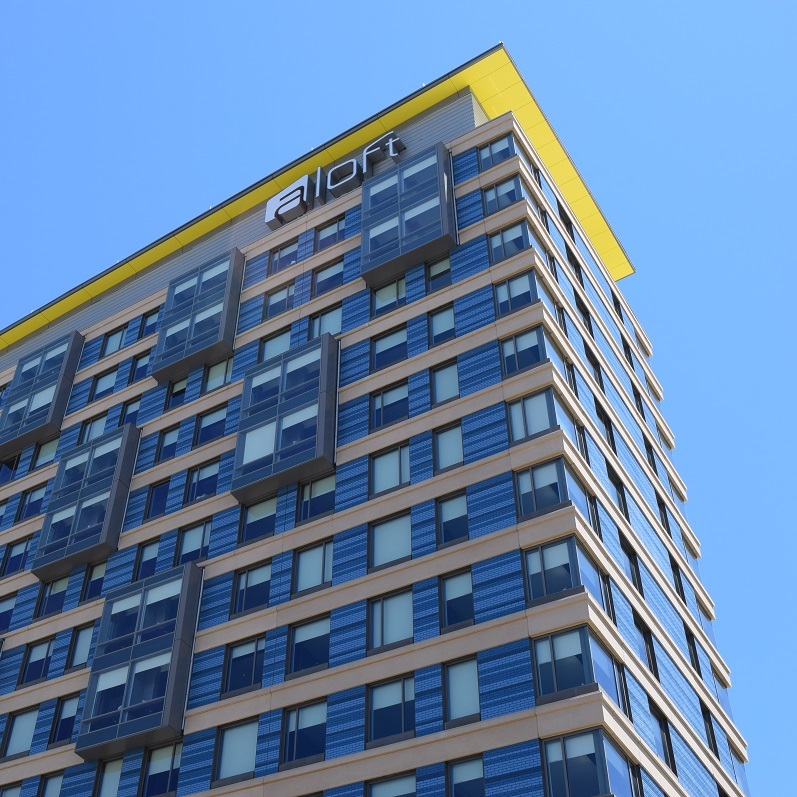 The Aloft and Element Hotels on D Street in South Boston are the newest, best example of how commercial development, done right, can create a windfall for a community. 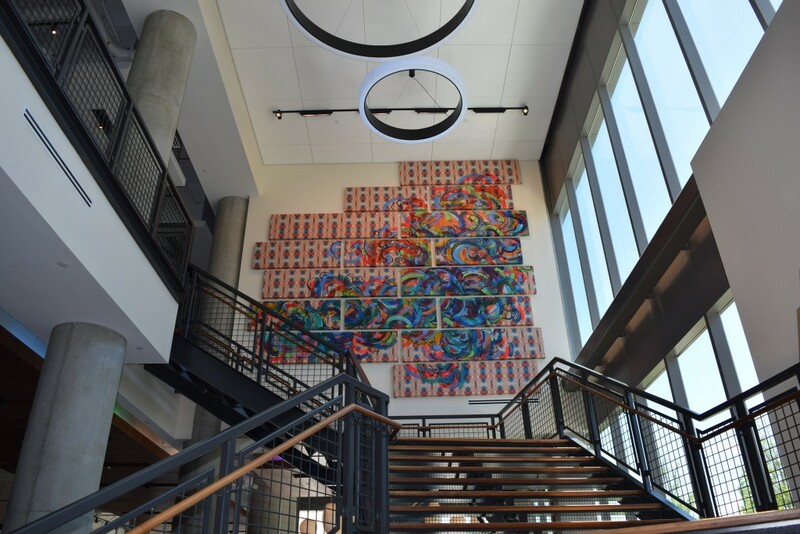 From its innovative use of Neighborhood Jobs Trust funds to a sizable community benefits contribution to the very artwork on the walls, this CV Properties development has raised the game for commercial construction in the city of Boston. Typically, when large-scale commercial developers pay mandated linkage fees (fees based on square footage) into the Neighborhood Jobs Trust (NJT), the city dispenses that money to various job training programs. However, developers do have an alternative. Using the jobs creation option, they can request that their fees specifically fund a training program for workers they agree to employ at their finished development. When Richard Galvin, founder and owner of CV Properties, learned that local nonprofit BEST Corp. trained hospitality workers, he jumped at the chance to use the jobs creation option – believed to be only the second incidence in the NJT’s nearly 30-year history. Of the more than $300,000 that CV Properties paid into the NJT, $176,400 was dedicated to the jobs creation partnership with BEST Corp. As part of the deal, tenant Starwood Hotels – operator of Aloft and Element – committed to hiring 29 of the 42 participants who were trained in three cycles from July 2015 to May 2016. BEST Corp. worked to place the remaining graduates in other partner hotels. “BEST Corp. students blew us away with their knowledge of the brands….It’s a win-win for all involved,” said Monica Hurd, Complex Director Human Resources for the Aloft and Element Hotels. 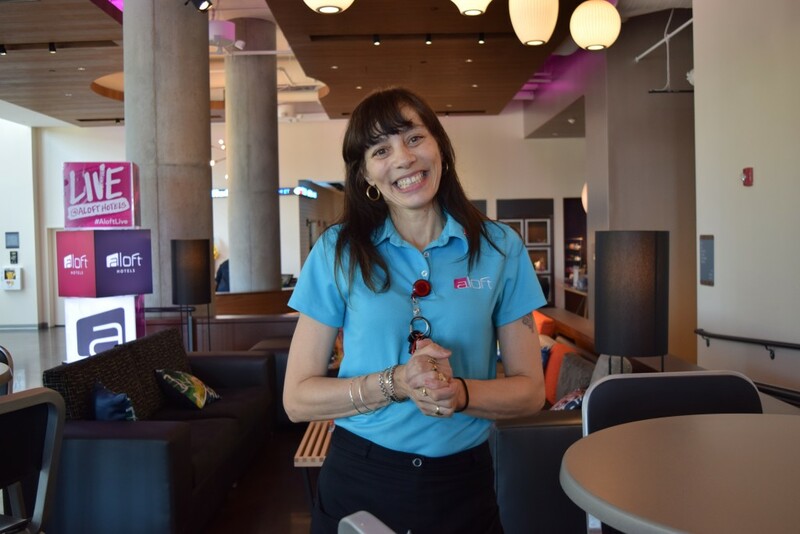 BEST Corp. graduate Evelyn Cruz gained full-time employment with benefits as a room attendant at the Aloft Hotel. 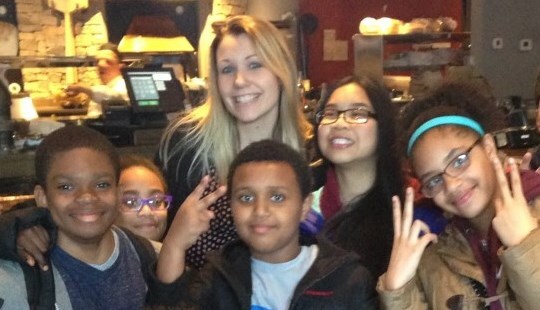 For program graduate Evelyn Cruz, it was a life-changing win. Prior to entering the program, she was working a part-time retail job after a recession lay-off. Now Cruz is working full-time as a room attendant at Aloft and earning benefits. Now that she is making better money, Cruz hopes to save the $3,000 necessary to help her daughter, a mechanical engineering student at Penn State, finish her final year of classes. Meanwhile, the city is hopeful that more developers will avail themselves of the NJT jobs creation option. Already, BEST Corp. is meeting with other developers interested in following CV Properties’ lead by creating jobs for program graduates at their developments. Local artist Destiny Palmer created this large-scale work for the Aloft Hotel staircase as a result of a request for proposals the developer issued to Fort Points Arts Community, a non-profit that preserves the artists’ community in South Boston’s Fort Point neighborhood. When reviewing large development projects, the Boston Redevelopment Authority (BRA) works with community members and developers to negotiate a community benefits package for local neighborhood improvements. Historically, the BRA had no formal protocol for awarding community benefits funds. But that all changed with the Aloft/Element project. For CV Properties’ community benefits contribution, the BRA issued a public, competitive request for proposals (RFP), allowing local organizations to envision how best to use the money to help their community. As a result of the RFP process, $630,000 in community benefits money was distributed to 25 local non-profits. The effects were soon seen sprouting across South Boston: new equipment and uniforms for girls’ softball and youth basketball teams, free community concerts, renovation of the Boys and Girls Club’s 75-year-old building, public art projects, and new windows for the South Boston Catholic Academy to replace glass so old it had developed a permanent film blocking view of the outside. But not all of the changes were so immediately visible. Much of the money from South Boston’s newest development funded the development of people. The Joseph M. Tierney Learning Center, for example, used its $20,000 in community benefits money to expand an after-school program for teens and pre-teens from the Old Colony Housing Project. Most of the kids attend every day. Because what would they be doing otherwise? Dion, Bisrat, and Rachelly pose in the front row (l to r) on one of their after-school program’s many excursions. Tierney Center Director Kristin Taylor is in back. “Being home,” said Bisrat, 11. “Being bored,” said Dion, 14. At the Old Colony Housing Project, that’s a dangerous proposition. “Options” is quite possibly an understatement. When Tierney’s adolescents aren’t working on science and math projects – making magnetic slime, desalinating water, what have you – they’re exploring the world beyond their housing project. Over the past year, they’ve tried skiing and ice skating, learned to sail on a historic schooner, produced a “recycled” fashion show, volunteered for the Martin Luther King Day of Service, dabbled in sneaker engineering, and worked on team-building on Thompson Island. They are constantly on the go and constantly working together. But to build what? The ability to fall and get back up, said Bisrat (who got more than his fair share of practice on the slopes). 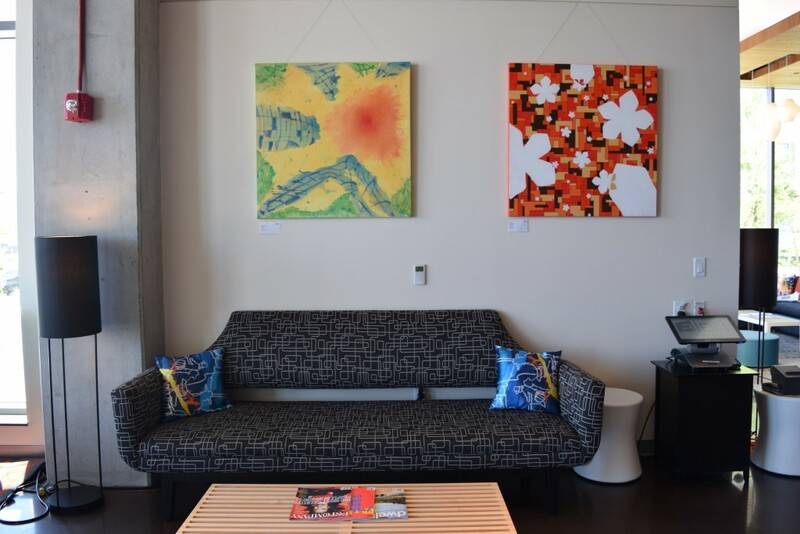 The paintings that brighten the Aloft Hotel lobby were created by community artists from Artists for Humanity, a South Boston non-profit that connects urban youth with employment in art and design.